Lavishly luxurious yet effortlessly chic, UNBRIDLED embodies the superyacht lifestyle at its finest. She is the ultimate yacht for comfortably enjoying the far reaches of the World. With one loving owner since new and an interior refurbishment in 2015, she now presents immaculately. 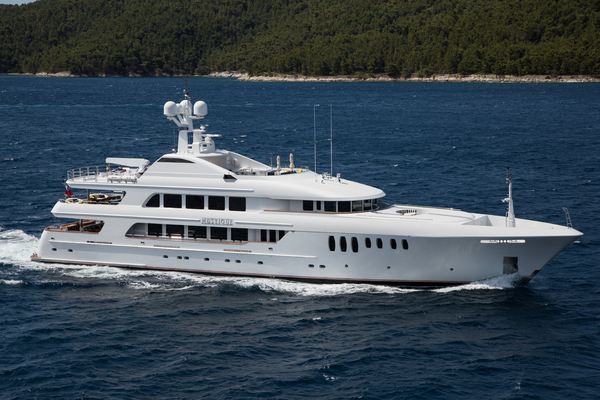 UNBRIDLED is a proven global cruising platform and comes with an enviable charter record. Her sumptuous interior boasts accommodation for up to 16 guests in six adaptable cabins. The layout includes a full beam master suite with a private study, four oversized guest cabins (2x VIP and 2x twin with additional Pullman berths), and a dedicated guest office that can convert into an additional cabin. The elegant formal dining room, wine cellar and one of the largest sky lounges you will find on a yacht of this size, have made UNBRIDLED the entertainment choice of royalty. UNBRIDLED's outdoor spaces provide endless areas for entertaining. Her expansive sun deck boasts an oversized jacuzzi and bar area which is perfect for relaxing with family and friends. UNBRIDLED's highly experienced owners have fitted out the yacht to ensure enjoyment for those with an active lifestyle and also for avid divers, boasting an extensive array of dive equipment. In addition there is a large compliment of tenders and water toys accommodated in the garage, ensuring every anchorage will be enjoyed to the full. Having been lovingly maintained and adored as a family home, the owners are now moving to the next chapter in their yachting career. Inspections encouraged. United Yacht Sales New Jersey would love to guide you through a personal showing of this 191' Trinity 2009. This yacht for sale is located in en route to Newport, RI, Rhode Island and priced at $24,999,000. For a showing please contact us by filling out the form on this page and we will get back to you shortly!